Parichy and lead author Dae Seok Eom, a UW postdoctoral researcher, discovered this new role for macrophages while studying zebrafish. They had wanted to understand how the zebrafish gets its telltale stripes of silver-yellow and black. Each color — black, yellow and silver — arises from a different type of pigment cell. When zebrafish are juveniles, these pigment cells migrate to the right spot to create the stripes. 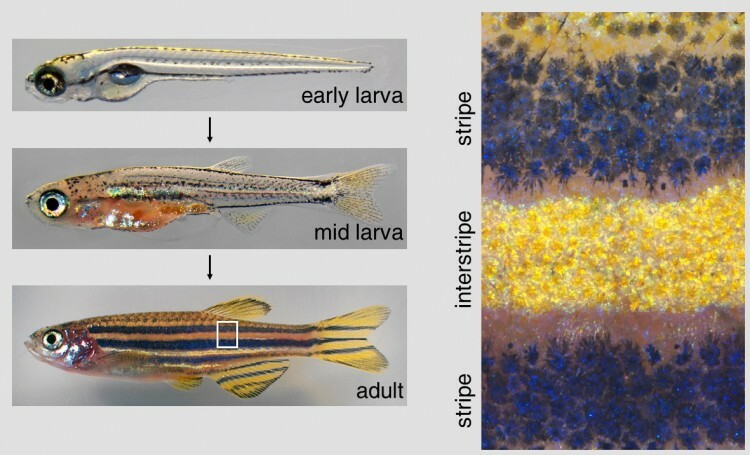 “As they migrate, communication among these three populations of pigment cells is critical to forming the stripes we see in adult zebrafish,” said Parichy. Eom and Parichy used laboratory genetic tools to make zebrafish pigment cells glow fluorescent colors — making these cells easier to track using a microscope. In the process, they discovered that xanthoblasts — the precursors to yellow pigment cells — produced unique, elaborate projections during the peak time for pigment pattern formation. Eom discovered that these projections — which they named “airinemes” for mathematician and astronomer Sir George Airy, who described the optical limits to view small objects, as well as the Greek messenger goddess Iris — contained tiny, membrane-bound packages of proteins that provide molecular signals to melanocytes, the black pigment cells. The researchers showed that when an airineme from a xanthoblast encountered a melanocyte, the signal proteins from the airineme would cause the black pigment cell to migrate into the stripe. Video: xanthoblast sends out airinemes, which take circuitous paths. But they didn’t understand how airinemes found melanocytes, or why they took such a seemingly random route, until Eom made a critical observation. Macrophages are constantly on the move. In fish, people and everything in between, they wander the tissues of the body, “crawling” along like amoebae. Along the way, they sample their environment, picking up and ingesting debris. Their scavenged prizes are often harmless cellular detritus. But if they ingest a bit of a pathogen, or receive signals that a cell nearby is under assault from an invader, macrophages can alert other cells of the immune system. Under the microscope, Eom captured images and movies of how macrophages behaved when they randomly encountered an airineme. A macrophage would seemingly “engulf” one of the round, globular protein packages on the airineme and drag it along, stretching the airineme out. But when that same macrophage encountered a melanocyte, the macrophage appeared to “hand off” the airineme to the melanocyte and wander away, presumably delivering the message — via the airineme — to the melanocyte. Video: a macrophage (purple) drags an airineme from a xanthoblast (green) to a melanocyte (magenta). When the airineme stabilizes on the melanocyte (arrow), the macrophage wanders away. The left panel shows only macrophages and xanthophores/airinemes. The right panel shows the same movie, but with melanocytes now visible. Upper left shows elapsed time (hours, minutes). Eom showed that airineme membranes contain a type of lipid that is often an “eat me” signal for macrophages, which may explain why the macrophages attach to and drag along these projections. He and Parichy plan to investigate why macrophages do not digest the airinemes and how the airineme is “handed off” specifically to a melanocyte. But given the macrophage’s tendency to wander and pick up objects, Parichy believes this is unlikely to be the sole instance of macrophage co-option by cells outside of the immune system.